In high school, the big stupid prank was pulling the fire alarm. At one point, the school administration covered the alarms with a chemical that would turn the prankster’s fingers pink. Upon inspection by teachers and administrators, the perpetrator was outed. Of course, this was the seventies and gloves weren’t invented yet. We’ve had a decade to reflect on what happened. I’m finding out that there is a limited consensus on the specific cause or the moment of truth. Marketplace put out a piece with a video of Dodd and Frank that is way too long. Frankly, I ran the video as background noise when I was working. Frank famously missed the development of the crisis years earlier and Dodd was outed for being a “Friend of Angelo” so it is weird to see them placed as the elder statesman of the fixing of the crisis. Dodd-Frank was overreaching and tried to prevent the past crisis from happening again. Yet each future crisis will be based on something emerging from the distortion of the past. This is a national platform yet it got fewer views (765) than my friend Phil Crawford gets on his Voice of Appraisal podcasts. 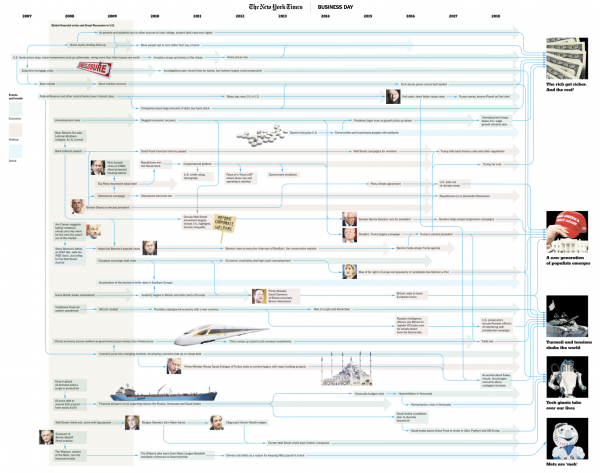 However, there was an epic New York Times Business section infographic that I implore you to look at. Click on the graphic to explore. Visit the Appraiserville section below – “Reflecting On The Financial Crisis a Decade Later” – a snippet of my own take on the front lines as an appraiser. 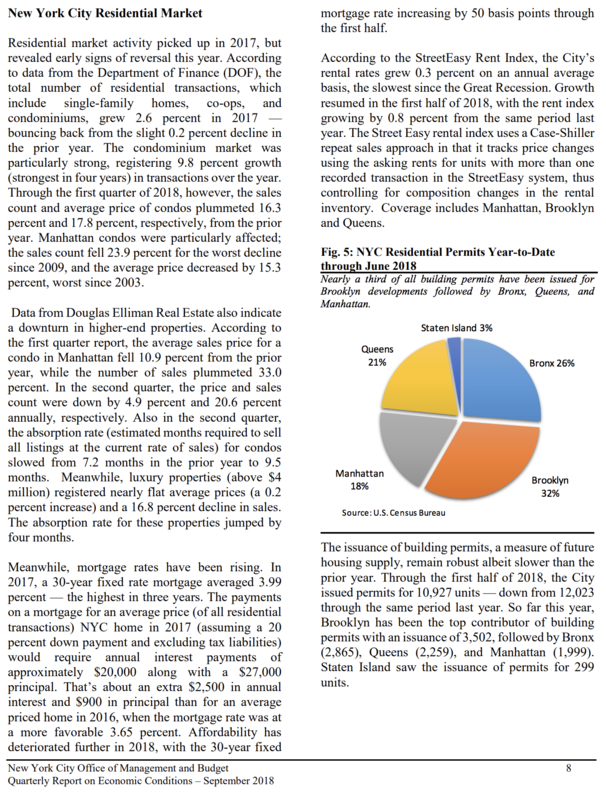 This NYC OMB economic report is more numbers-centric than the Fed’s Beige Book, but just as digestible. It chronicles the same slow down in sales that I reported on earlier this year. Also, Brooklyn saw the most permits while Manhattan had the second-lowest of the 5 boroughs. Wall Street (The Securities Industry) has been a core economic engine for decades. The Office of the New York State Comptroller just released their report on the state of the securities industry. 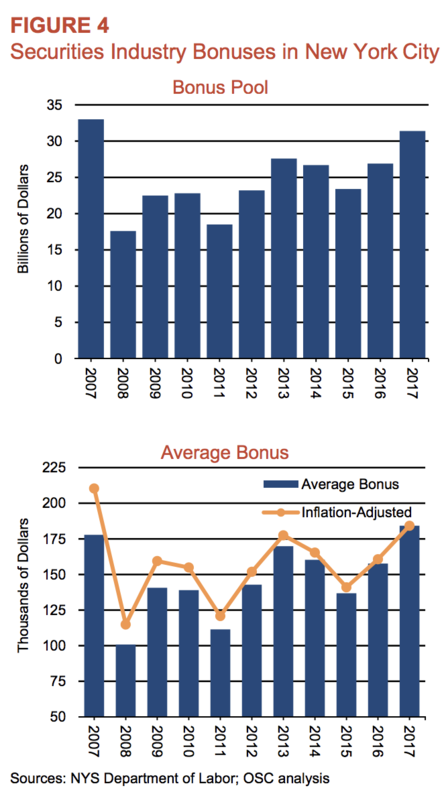 Bonuses made up 40 percent of securities industry wages in 2017, a much larger share than in any other industry. And with deferred comp growing, gone are the days when the bonus announcements would cause an Oklahoma Sooners-style rush to buy real estate. Still, the performance of the securities industry is critical to the housing market and the NYC regional economy, so there’s that. Hopefully news outlets will completely stop doing stories on Wall Streeters rushing to buy the latest edition Maybachs during bonus season. 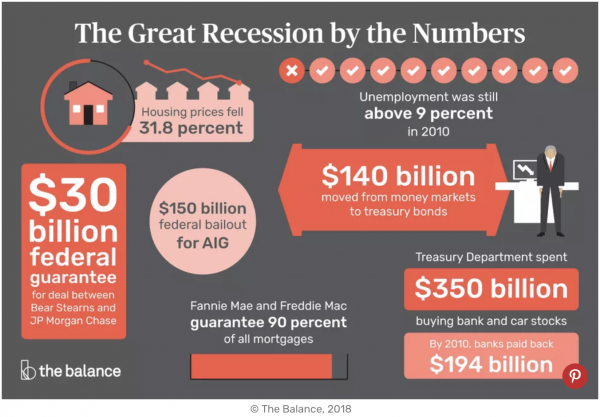 Over the past several weeks, there has been a slew of thought-provoking pieces on the financial crisis of ten years ago. There are so many varying views on what happened and what caused it. It was such a systemic event that ten years later, there are strong opinions on the cause and the lessons learned and not learned. I’ve always looked at it from a valuation/mortgage/credit standpoint since that has been my business orientation. I saw the events roll out from my perspective, but I only saw a sliver of what the crisis represented. Mortgage brokers I knew that thrived back then, are either gone or generic loan reps at large institutions, never to be heard from again. Appraisers I knew who succeeded on the massive volume thrown to them by star mortgage brokers collapsed and lost their licenses or their businesses. Those appraisers never lost their self-respect because they didn’t have any, to begin with. I was a confusing and stressful time as I wondered what math class I missed in high school and what ethics class I missed in college as our business suffered and my competitors made deals with mortgage brokers from the back of limos. In 2005, I was sure I would be out of business by 2008. Fortunately, it worked out in the long run but the period from 2005 to 2008 felt like an eternity. Late in the crisis, I provided numerous consultations to the office of NYC Attorney (then Andrew Cuomo) to understand the problems appraisers faced from enormous economic pressure by mortgage brokers to hit the “number” but being disappointed when Cuomo opened the AMC pandora’s box with HVCC. A deputy told me they pushed the envelope as far as their authority reached, but it enabled AMCs, the institutional middleman that has mostly served to destroy quality valuation practices in the U.S. Cuomo’s office wanted names of the perpetrators and I basically said it was systemic and there were no names to give because it would be almost all the names in the mortgage broker industry. After all, why did a mortgage broker get to pick the appraiser they used when the mortgage broker only got paid if the deal closed. At one point I was literally on the phone with Cuomo’s office and at the same time got an email from a mortgage broker in Florida who was looking for an appraisal to be completed in New York that needed to be at least $1,200,000 so the borrower could draw down money to buy a boat. At that moment I could have forwarded that email to the AG, but because nearly all mortgage brokers spoke like that, it confirmed to me that it was systemic and not a few rotten eggs. If only that mortgage broker knew how close she came to losing her license. Although the Lehman moment didn’t cause the financial crisis, it was a symbol of the beginning of true consumer awareness of the problem. Sales contracts collapsed 75% in my market from September to December. However, I saw the rumblings begin in the prior summer when the two Bear Stearns mortgage hedge funds and American Home Mortgage collapsed. I experienced this first hand when the head of those funds join a company that was going to acquire our company. I disconnected from the relationship shortly after that. My wife and sister, who are my business partners, sat down and reinvented our business, jettisoning appraisal management companies and most retail mortgage work, inverting our practice away from mortgage rate dependent work. In many ways, the experience was a gift, because our firm became more profitable and we focused on good clients. We avoided clients represented by a 19-year-old chewing gum demanding to know where our report was ordered 24 hours ago. My good friends Ernie and Phil show us a Cincy-style discussion on appraiser issues of the day at the 2018 RAC conference last week in Plano Texas. The New York Times did a great piece on Zestimates and the addicts that check them daily. I chime in about your horoscope – BTW I’m a Libra so I’m clearly “well balanced.” Then Ryan Lundquist shows how much the Zestimate weights the current average sales price with an actual example. It’s amazing. Read the piece in Realtor Magazine. The following CSBS article essentially written by the Appraisal Institute which is being distributed by lenders – continues to misrepresent the idea that the number of appraisers is falling and no new appraisers are coming into the profession. Notice how CSBS tracks the number of appraisers from the peak of the housing bubble? If this organization’s or the Appraisal Institute’s intentions were honest, they would show the trend before the housing bubble as well. In this piece, they show that credentialed appraisers have fallen 21% in 10 years which is far less than Appraisal Institute membership. 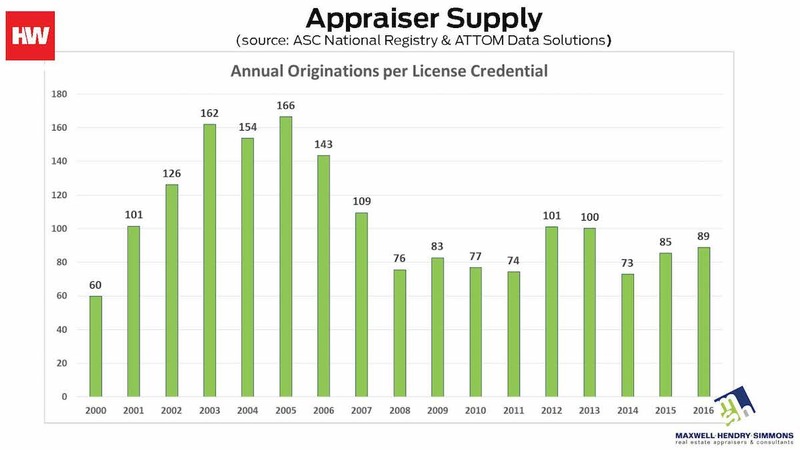 There are actually more appraisers now per mortgage origination than back then. Why? Because despite record low rates, mortgage origination volume has fallen since 2008. That my friends is the missing context here. In other words, the CSBS/AI research piece is at best propaganda and at worst, a lie. Some rural and underserved areas do not have enough appraisers. That’s been the case for one hundred years and only became problematic when AMCs became dominant and typically pay less than half the market rate. The National Registry of Real Estate Appraisers does not accurately reflect local shortages of appraisers. And it doesn’t show surpluses, nor does it reflect non-free market business practices of the AMC industry that AI National so dearly loves. The Title XI waiver process is unclear, lengthy, and underutilized. This is a bizarrely desperate and a made up reason that sounds impressive but says nothing. Congress acknowledged with the passage of the “Economic Growth, Regulatory Relief, and Consumer Protection Act” that obtaining appraisals for certain rural transactions are an issue and that an avenue for relief is needed.This a wildly misleading statement of what this act actually is. According to ABA: to qualify lenders must show that three appraisers were not available within 5 days beyond a reasonable time frame (determined by the bank) for an appraisal. Appraiser licensing and credentialing processes create barriers to entry.Name one! We’d have a lot more doctors if we didn’t require an education and experience. Can these reasons be any more self-serving and dumb? 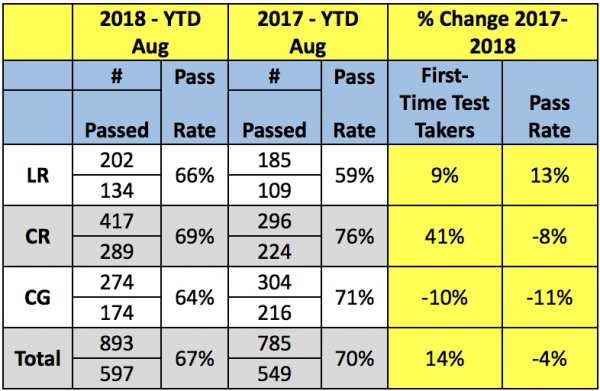 Over the same period last year, there has been an increase of 9% people taking the Licensed Residential exam; an increase of 41% taking the Certified Residential exam; and a decrease of 10% people taking the Certified General exam. 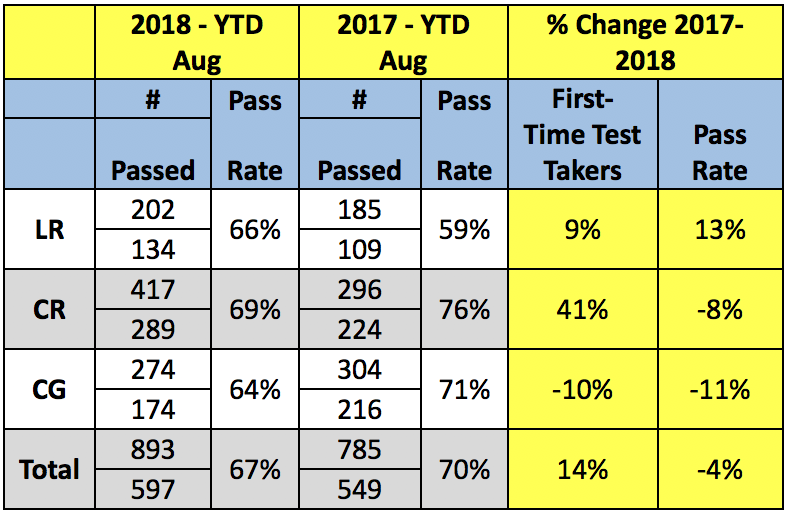 The overall total equals a 14% increase in the number of people taking an exam in 2018 vs. 2017. Here is a chart that tracks the age range of test takers from 2013 to 2017. 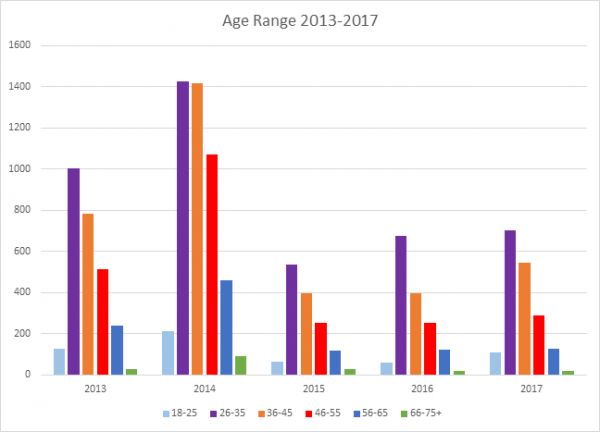 The 26-35 subset (purple) is the highest for each year showing that youth is indeed entering the profession. Requests to purchase parcels or portions of City-owned property are first reviewed by all relevant City departments to determine whether the property is planned for future uses by the City. If the City verifies that the property can be sold, the request is forwarded to the City Council for conceptual approval of the sale. If the sale is approved in concept, the applicant must provide a current survey of the property along with an appraisal prepared by an MAI-certified appraiser. Upon receipt of these items, the purchase request is forwarded to the City Council for final approval. Purchases are often subject to reservations for existing utilities or easements. E. The value of land dedicated or donated shall be based on the appraised land value of the parent parcel on the date of transfer of ownership to the city, as determined by an MAI certified appraiser who was selected from a list of city approved appraisers provided by the director and paid for by the applicant, who used generally accepted appraisal techniques. Market Value: For purposes of flood control regulation, the market value of the structure itself, not including the associated land, landscaping or detached accessory structures. The market value must be determined by a method approved by FEMA and the Bureau of License and Permit Services. If an appraisal is used, the appraiser must have at least one of the following designations: 1. Member of the American Institute of Real Estate Appraisers (MAI); 2. Residential member of the American Institute of Real Estate Appraisers (RM); 3. Senior real estate analyst of the Society of Real Estate Appraisers (SREA); 4. Senior residential appraiser of the Society of Real Estate Appraisers (SREA); 5. Senior real property appraiser of the Society of Real Estate Appraisers (SRPA); 6. Senior member of the American Society of Appraisers (ASA); 7. Accredited rural appraiser of the American Society of Farm Managers and Rural Appraisers (ARA); or 8. Accredited appraiser of the Manufactured Housing Appraiser Society.